Still Seeking Sanity: A Few Christmas Pics! Here are some Christmas pics, courtesy of Amy. The boys were a little excited about the day, and did not get a nap. 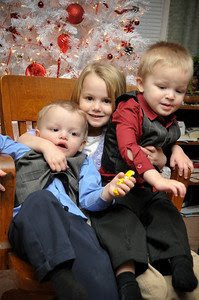 Sitting still is not a strong skill of theirs, but at least they were sharped dressed little men! Our little family. Don't the kids look thrilled? 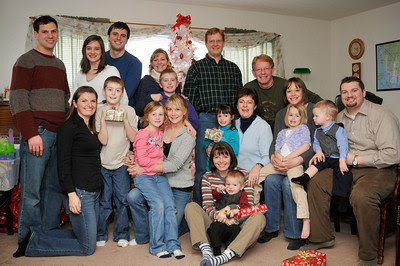 This is, "Really, we have to do family pictures BEFORE we open presents?!?" All of us together. 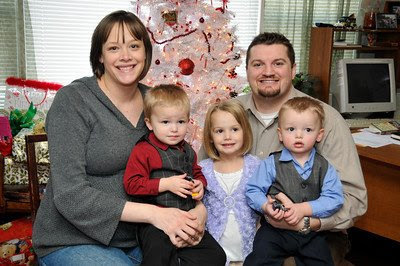 This is Marty's siblings, spouses, and kids. Love the socks, Holly! You can sure tell who's Emma's mama in that picture. They all look way cute! Great looking group; but someone's missing.....Do you think Amy could photoshop me in there. Or we could just draw a stick figure of me. I may have been gone this Christmas but I was there in spirit. You guys are in my thoughts and prayers. By the way ask Holly for some garbage bags you know she's stocked up on everything for 3 to 6 months. LOL!! !